MV: One of my favorite things as a kid (and still now) is comics and superheros. Now some might think of me as mad, which I am not Thank Allah! But those of you that enjoy superheros and comics would understand. Regardless this post is very good news for the Muslims in America and other people’s views of Muslim as they are now teaming up DC’s superheroes including Batman and Superman! 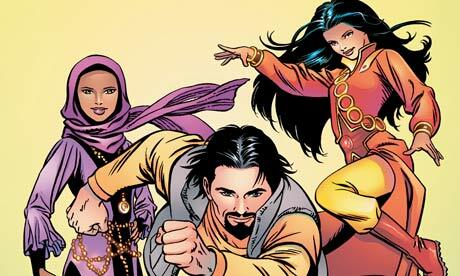 Muslims, as superheroes. They are superheroes battling injustice and fighting evil the Islamic way, and they are teaming up with some of the west’s biggest comic book icons. Superman, Batman and Wonder Woman are among those joining forces with The 99, who personify the 99 attributes of Allah, according to Islamic tradition. What will unfold on the pages of the collaboration between DC Comics in the US and Teshkeel Comics in Kuwait is yet to be seen, but the appearance of The 99 – who already appear in comics in the Muslim world – alongside archetypal American heroes would have been unlikely during the Bush years. DC Comics’ president and publisher, Paul Levitz, believes the cross-cultural project is unprecedented. The mini-series will hit shops within a year, with links between the publishing firms easing the creative process. Comic book aficionados have mainly responded positively to the news, although questions have been raised about how Wonder Woman’s skimpy costume will fare in the Middle East. Unlike their western counterparts The 99 do not wear disguises, unless you count the burka-wearing Batina The Hidden, nor are they outsiders with secret identities. They are ordinary people who develop extraordinary abilities after coming into contact with mystical gems infused with power and wisdom. Only Batina, one of five females, is fully veiled, and although characters pray or read the Qur’an, they are meant to appeal to children of all faiths. The team behind The 99 includes comic book stalwarts Fabian Nicieza, Stuart Moore, June Brigman, Dan Panosian, and John McCrea, who have all worked at DC Comics and Marvel. The 99 comics, which sell about 1m copies a year, enjoy a high profile in the Middle East. The adventures are to be made into an animated film, while the first of several 99-inspired theme parks has opened in Kuwait. About 23 heroes have been launched and there are more to come. Mutawa said: “We’re building the brand slowly.